Preheat oven to 350°F. Spray bottom of 9-inch springform pan with 2 1/2-inch-high sides with nonstick spray. Stir ground cookies, butter, and sugar in medium bowl until moist clumps form. Press cookie mixture firmly onto bottom of prepared pan. Wrap outside of pan with 3 layers of heavy-duty foil. Bake crust until firm and beginning to darken, about 14 minutes. Cool crust. Maintain oven temperature. Beat cream cheese and sugar in large bowl until smooth. Beat in butter, then eggs, 1 at a time, until just blended. Beat in vanilla. Pour batter over crust in pan. Place springform pan in large roasting pan. Add enough hot water to come halfway up sides of springform pan. Bake cake uncovered until filling is puffed around edges and moves slightly in center when pan is gently shaken, about 1 hour 10 minutes. Remove pan from water; remove foil. Place hot cheesecake uncovered in refrigerator overnight. Stir sugar, water, and lemon juice in large saucepan over medium heat until sugar dissolves. Increase heat; boil without stirring until mixture turns deep amber, occasionally swirling pan and brushing down sides with wet pastry brush, about 9 minutes. Add cream (mixture will bubble). Reduce heat to medium-low. Simmer until reduced to 1 1/4 cups, stirring occasionally, about 8 minutes. Chill until thickened but still pourable, about 15 minutes. 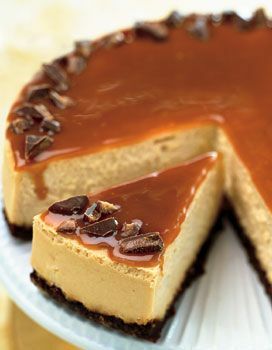 Spoon caramel over top of cake just to edges (do not allow caramel to drip down sides). Garnish top edges with chopped English toffee. Chill at least 2 hours and up to 6 hours. Run knife around pan sides to loosen cake; release pan sides.